DBI Sala's Self-Rescue is a detachable self rescue system that comes in a self-contained nylon pack with molded padding. The Self Rescue includes 50' of 5.5mm rope and can also be purchased in other lengths. 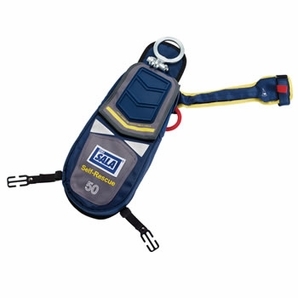 The Self-Rescue is compatible with almost any harness and features an EZ-Link D-ring for fast connection. DBI Sala EZ-Link D-ring for quick connection The EZ-Link stand-up D-ring provides a simple, fast connection point for your lanyards or personal self-retracting lifelines. It will conveniently speed up connection and disconnection times by up to 80%, delivering time-savings every time you climb. Universal harness attachment Add the benefits of a self-rescue device without the added expense of purchasing a new harness. The Self-Rescue retrofits to almost ANY safety harness, so you can keep wearing your current harness; the one you’re most comfortable using! Assisted-rescue ring for incapacitated user If you are incapacitated after a fall and are unable to activate the Self-Rescue device, the assisted-rescue ring allows for remote access and deployment by a co-worker. Sealed descent device and rope spool extends longevity The Self-Rescue device is a sealed system designed and tested to withstand the rigors of harsh environments. Lightweight, low profile design Lightweight, low profile design minimizes impact on user's motion. 50 ft. of 5.5 mm rope With both 50 ft. and 100 ft. models to choose from, DBI-SALA Self-Rescue gives you more flexibility and convenience for whatever your work site needs may be.